This year will be my 12th trip on one or more flat water sections of the Green River in Utah. Last year we did 95 miles in 11 days, but we had two more people joining us at the mid-point which allowed us to re-provision with fresh water, etc. This year, it's just the 52 mile Stillwater section, but we're taking 9 days to allow for lots of lazy exploring. We'll launch from Mineral Bottom and cover 6 pages of laminated maps. One of the joys of a canoe is that you can pack in larger packages. The two large Watershed bags hold my tent, sleeping bag, and all my clothes/stuff. The red Watershed bag is my "deck" bag with the trip permit, rain gear, snacks, etc. The yellow Pelican case for the larger camera slides under the seat. The canoe loads fast. For some reason, I feel like I'm missing something. The groover goes behind the grey water jug, but that leaves me with some open space in back. I'm sure we'll fill it somehow... That didn't take long - I've been elected to haul the main kitchen bag as well as the food cannisters. Obviously, I should have dusted off the boat before I took the picture. That's what happens when the boat hangs in the garage since our early March Black Canyon trip. BJ packs in many colorful, smaller packages. The IKEA bags make it easier to haul gear from the boat to the campsite and to organize it by what goes in the front hatch vs. the rear hatch. BJ has the bigger challenge as she fits all her gear into her kayak hatches. Usually the system is pretty standard, but this year we're carrying more water and we switched to miniature drums for the food which now goes in the canoe. What size spots are left? It all fit, with space to spare. She even found time to test fit her windsock thingy, and then to test her load for her second trip. We come off the river and then a couple days later she launches again to do the trip over with her girlfriends. A couple more days and we'll get the truck loaded. I'm looking forward to yet another Green River trip! It was only because I was paddling an SOT that I realized my left boot was failing, again. I re-glued the sole about a year ago, but it was failing again. Better to see it now, than on a 9 day Green River trip where the fix would involve a roll of grey tape. I guess I shouldn't be surprised. I usually only get three years out of a pair and time was up. A trip to town scored the last pair in my size from REI. They quit making the style that I had been using, so I'm back to zippers. Zippers don't like Green River mud, but they'll work. Turk wasn't too sure. He's smart enough to know that he's about to be farmed out to our daughter while we're on the river. He'll be getting even more antsy as time gets closer and the pile of gear starts building. By the time you read this, we'll be on our fourth day of our almost annual Green River trip. We've lived in East Mesa for 15 years now, and for all that time, we've driven past Prospector Park in Apache Junction. Now that the weather is cooler (read - less than 100 degrees), we've visited the park a couple times for walks in the desert. 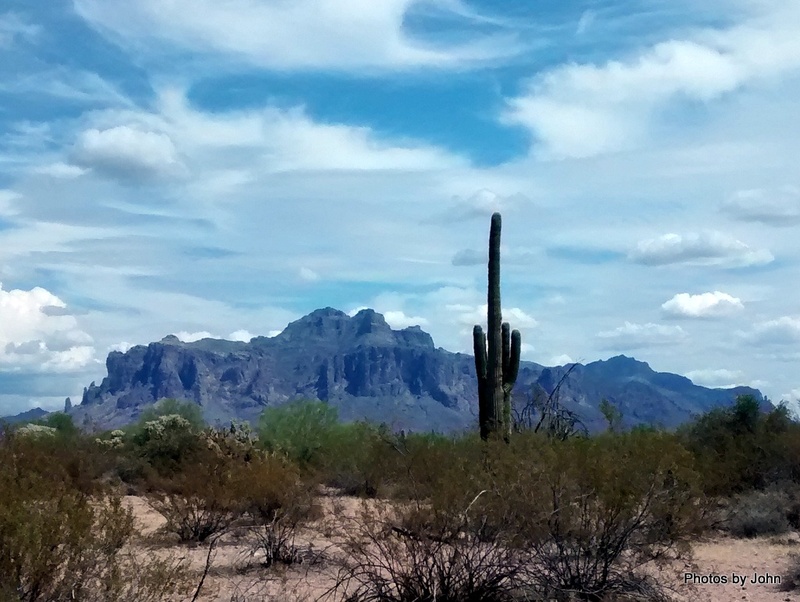 The park is about half way between our house and the Superstition Mountains. AJ doesn't charge for access to their parks, unlike Lost Dutchman State Park or some of the areas of Tonto National Forest. There are some footpaths and horse trails that wander through the desert as well as a gated road that provides access to the high tension power lines that come to the valley from the dam at Canyon Lake. We've combined wandering and walking with geocaches. This one was one of my favorites - a tape measure, bobber, and lure hanging high in a tree. It was intended to be accessible using a long stick, but the lure had wound around a limb in the high winds last week so I had to climb the tree to get it. The log was in the yellow "bobber." Another cache was located in a cowboy boot, and was filled with kid friendly swag. The cache owner put a lot of effort into this one to make it kid friendly. Of course, a cowboy boot isn't weather tight, so this Bailey's canister was inserted in the boot. Looked pretty adult friendly to me! We spent quite a while looking at this saguaro. The top looked perfectly healthy, but the lower section of the main trunk was deeply scarred. I think it was disease rather than birds, but I've never seen anything like it. Sure looked like a good geocache host to me! A little while back, one of BJ's friends gave her a jigsaw puzzle because of the subject matter. Vintage trailers with over 1000 pieces. Plenty tough, but this one was circular, with the picture wrapping around the sides of the box and the label covering up part of the picture. Never one to avoid a challenge, BJ jumped right in. The outer border didn't hold together to well, but she got all the obvious pieces in place. When something like this shows up on the table, I usually get real scarce. Trying to fit the right pieces together, just so you can take them apart again, takes more patience than my limited supply can handle. On the fourth day, it really started coming together. Down to everything except one Airstream. But this was my favorite trailer. Loved the eyebrow windows, even if they would be miserable to maintain over time. Roger Miller's 1964 "King of the Road" immediately came to mind when I saw the sign. It's been a lot of years since the calves I was raising would enjoy their hay to his music! And just in case you're wondering, NO, the Scamp isn't For Sale or available to rent! When I retired, I asked BJ if she would start cutting my hair. She had years of experience in a pet shop, so how tough could it be? Why pay for haircuts when I could get them free at home? I guess it will grow back. When I started volunteering with Rebuilding Together, they told me that they didn't do ramp projects during the summer. That was fine with me - I really don't enjoy working in 105+ temperatures, but the reality is that the need continues, so I committed to an August Saturday project. We had a huge crew of volunteers from Bank of America. With that many people, we split them into three teams. One group started framing up modules to be used on the next ramp build. One group put in a paver walkway. The client had a ramp, but it was inadequate for the weight of her motorized chair, so my crew started by demo'ing the existing ramp and then constructing a new one. Some of the crew had worked Habitat projects, and all of them had good tool skills, so things moved quickly. By 11:30, the home owner and the volunteers were celebrating. Two projects done for this client, and prep completed for the next client. Thankfully, I think the weather is going to start to break. By the time we get back from the Green River, temperatures should be much better. I've been having a bit of fun in the garage, prepping some cache containers. The caches vary in size from the ammo can to the nano-cache sitting on top of the ammo can. The small canister in the front left, the tag hanging on the 4" ABS pipe, the rusty can (with another tag stuck on the bottom,) and the Altoids tin will all be used on a single, multi-section cache. The other containers will be used on other caches. The first one to be released was the wood 4x4 with the lag bolts in it. On this one, the trick isn't finding the "hide," but rather, figuring out where the log is hidden and how to access it. Only time will tell if it turns out to be too easy to be fun or too frustrating. Two of the first three people to find it gave it a "Favorite" point, so I guess I hit the mark. I took the kayak out early one morning, launching on Saguaro Lake at first light, heading out for a fun morning of placing caches. These won't get much traffic, but should make a fun day for waterborne caching, especially during the fall, winter, and spring. For several years, I've used the solo canoe almost exclusively. If I'm not mistaken, this is the first time in over two years that my sea kayak has been in the water. It was good to get the thick layer of dust off of it. I must admit, it's been fun dreaming up and placing some of these hides. Every time I'm out caching I'm reminded of our grandson who introduced me to this sport. Do I Detect Some Toe Tapping? When I got home from my cool Colorado trip, BJ proudly announced that she had all the packing done for her "girls" river trip - a trip that doesn't launch until early October! She was also nearly done packing the food for our trip that precedes the "girls" trip. This time, we're using a small, almost 4 gallon, drum for food instead of putting it in a dry bag. Usually, we've done meals with dry and canned foods from the grocery. This year, we're using freeze dried for about half of the main meals, just to make it easier. The most important package is the survival package. This zipper case has been with us for several years, holding all the lunch stuff, which BJ jealously guards in her front hatch. By mid day, it seems appropriately named. It's always amazing what sort of stuff she'll pull out of this. Always a surprise, and we're sure never going to go hungry. Now the trick is to keep the dog out of it, until we actually load up and head north for our trip. This year there are six of us going, and we're taking longer to do just one section. Looking forward to even more time for exploration. I broke camp at Homolovi State Park too early to visit the ruins so that will wait until next time. Even though it was early, Winslow was awake and I found a spot to park the rig next to the resurrected La Posada Hotel. Winslow was originally a railroad town, complete with a roundhouse and steam engine maintenance facility. 1950's the hotel closed and for almost 40 years was used as offices for the Santa Fe railroad. When the railroad threatened to tear it down in the mid 1990's, a Route 66 fan bought it and started to restore it. The hotel seems to do a good business if the number of cars in parking lot are any indication. The architecture is wonderful, and they have done an excellent job with the restoration. The Turquoise Room is open again, and drawing accolades for their food and service. I didn't go inside, but did wander the grounds for a bit without getting kicked out. It's on my list of places to go back to visit. The hotel was designed with a number of intricate gardens, all of which disappeared during the railroad office phase of existence. The owners are now developing the gardens again. The trees have grown to the point that it's difficult to get an inclusive picture of the building. Today, the La Posada continues to serve not only as a hotel, but also as the train station for Winslow. Of course, any visit to Winslow would be incomplete without a visit to "the" corner made famous by the Eagles. You'll note the girl in the flatbed Ford reflected in the window. To make it complete, there is an eagle sitting on the window sill of the second story. Although early, on the eastern corner of the same intersection, the t-shirt shop was already open for business and the 5 couples on motorcycles touring from Indiana were trying to pick out "the" best souvenir of their visit. In spite of the revival of the La Posada and the draw of the corner park, Winslow continues to age. While Route 66 runs through downtown, almost all the traffic bypasses on the Interstate, not realizing the opportunity to visit and then leave town with a song stuck in their heads. I left town headed south, and by noon, this trip was history.